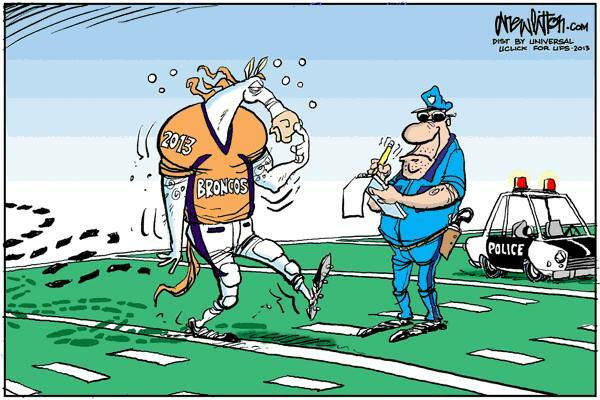 It's been a rough offseason for the Denver Broncos. Football executive Matt Russell and Tom Heckert were both suspended by the team after June DUI arrests, something reserve center Quentin Saulsberry was also docked for earlier this offseason. On Monday, more bad news came by way of a four-game suspension for All-Pro outside linebacker Von Miller, as ESPN's Adam Schefter first reported. Miller reportedly received the suspension for breaking the league's substance-abuse policy. Thankfully, it doesn't sound like Miller was busted for PEDs (performance enhancing drugs). Miller and the NFL Players Association are fighting the suspension, emphasizing that he did not use steroids, or any other muscle-building drugs. I can also confirm that Von’s case does not involve the Steroids and Related Substances Policy. The Denver Post's Mike Klis has reported that Miller was caught taking amphetamines and marijuana during his rookie season, but was not suspended, per NFL policy. First and second offenders of recreational drug use are placed into an NFL program, per Klis. Repeat offenders are given four-game suspensions. Such policies seem to indicate that Miller has been suspended for taking recreational drugs, not PEDs. As for Miller, he says he did nothing wrong and expects the suspension will be "resolved fairly." If Miller's appeal falls through and his suspension is upheld, his $537,441 salary during those four weeks will be revoked, and he could ultimately lose over $1 million this season, per OverTheCap.com. In Miller's potential absence, free-agent signee Shaun Phillips would likely start in his place across from Wesley Woodyard at outside linebacker. Last season, Miller recorded 18.5 sacks; Phillips recorded 9.5.